Masa harina, a fine corn flour, gives this bread light texture with nice corn flavor. Heat oven to 350 degrees F. Generously brush a 12-inch cast iron skillet with 2 tablespoons of the butter; set aside remaining butter. In large mixing bowl combine cornmeal, sugar, masa harina, baking powder, baking soda, salt, and pumpkin pie spice. In another bowl combine remaining butter, buttermilk, sour cream, egg and pumpkin; whisk into cornmeal mixture. Pour into prepared pan. Bake for 22 to 25 minutes or until a toothpick inserted off-center comes out clean. Cool on wire rack. Wrap cooled corn bread in foil. Store in refrigerator up to 2 days. Reheat, wrapped in foil, in a 350 degree F oven, for 15 minutes or until warm. Serve warm with whipped butter. Makes 12 servings. 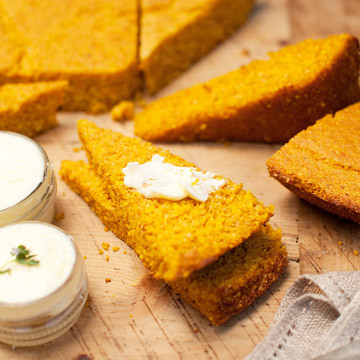 To serve right away: Corn bread may be served warm after baking. Cool 10 to 15 minutes after baking.